Scaled down version (0.75) for kids or small frame women proton packs. Display continuously ramps up and down when powered. Two display modes. Activate firing mode by pressing the black push button switch. Includes flickering barrel light and glowing core light. 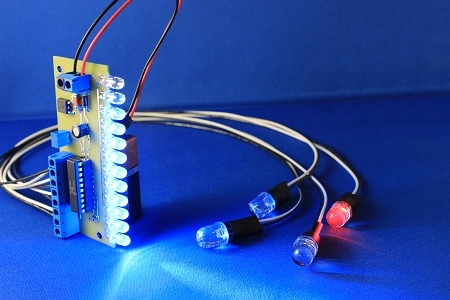 Glowing core light is controlled and activated separately. Custom made bright yellow LED bar graph. Includes screen accurate toggle switches and one black push button, all prewired (as shown). Bring your GhostBusters Proton Gun or Thrower replica to life and add significant value to your prop with this electronic circuit. Compact board, 2 x 1-5/16 inch or 51 x 34 mm. Less than 1/2 inch thick or 12 mm. Display automatically ramps up and resets. 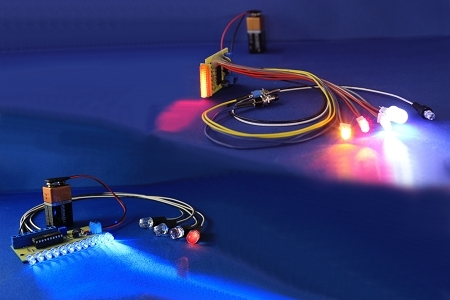 Bright blue LEDs, making a display of exactly 3-1/8 inch in length (78 mm). Also includes 4 bright Cyclotron red lights, as shown. Compact board, 3-3/8 x 1-3/4 inch or 86 x 44 mm.